The doctrine about the Person of Jesus had troubled both the common believer and the theologian from the very beginning of Christianity but had not surfaced until the time of Constantine. A quarrel which began between a Libyan priest called Arius and Alexander, bishop of Alexandria, about the true doctrine of the Person of Jesus turned into a sharp dissension and split the clergy into two major antagonistic parties. Arius claimed that there was only one Person, God the Father, not three distinct, equal and co-eternal Persons in God. The Son was not exactly of the same nature as the Father and therefore was not equal with the Father and had to be subordinate. Jesus was the Son in that he was the highest of created things, a sort of demigod created for the salvation of the world. He had a human body but not a human nature. Nevertheless his inhuman nature was not equal to God. Arius' opponents, however, held that God and the Son were 'of the same substance,' or homousios. For Constantine to hear news of such dissension at the time he saw the new faith as a weapon to achieve unity in his empire was frustrating. This was not the first time that the peace of his empire was suffering from a heresy because it had already been disturbed by the Donatists1 of North Africa as early as 313. However, that was a regional heresy and it did concern Egypt which was the major grain supplier of Byzantium, or New Rome (Nova Roma). He was also unable to comprehend why the Christians argued about something which is not mentioned in the Gospels and which happened in the past. The news from Egypt was so disturbing that while he was on his way there he cancelled the rest of his trip at Antioch on Orontes and returned to Nicomedia. He decided to call a council of all bishops at Ancyra (Ankara) because it could be reached by the two halves of his empire easily, after Easter 325. However, later he decided to transfer the council to Nicea (Iznik), where he could attend in person and control the proceedings. The First Council of Nicaea was regarded as the First Ecumenical Councils because of the large number of representatives who attended it. To achieve this the participants' expenses were met by the State and they made use of the State transportation service freely. However, with the exception of a few bishops who had come from the Latin West, all of the participants were Greek bishops and mostly from the Churches from the eastern half of the empire. Gregory of Nyssa and Jacob (James) of Nisibis (Nusaybin) were two of the participants. Later Christian tradition added some important bishops, such us Nicholas of Myra, to the list. The meetings began at the imperial palace by lake Ascania (Iznik) on 20 May 325 with Constantine's opening address urging the bishops to achieve unity and peace. The victory over the Arian heresy was achieved by the intervention of Constantine. The creed agreed upon by the emperor and important bishops and proposed for adoption at the council was sharply anti-Arian; affirming that the Son is 'of the same substance' with the Father. Its wording, however, could be interpreted by the Arians in their way. Although the number of participants may have been between 220 and 250, traditionally 318 out of 320 bishops signed the creed. The opposition came from the two Libyan bishops who were concerned not with the main issue but with a canon which subjected them to the control of Alexandria. Nevertheless, they were condemned and exiled like Arius who was present as an observer at the council. This was the first time that Christians persecuted one another for differences in faith. The meetings ended with a brilliant banquet. During the sessions and afterwards, until his death in 373, the flag of the Nicene cause would be carried by Athanasius who had left his desert hermitage to fight for the cause of orthodoxy, who accompanied bishop Alexander at the council as a deacon and stood by him. It would, however, take several centuries for Arianism to disappear completely. Arius is claimed by his enemies to have died in a lavatory in Constantinople where his bowels burst - thought to be caused by poison - but an end that his enemies regarded as the revenge of God. The council also discussed some matters of discipline in the Church. Until then while the West and Alexandria held Easter on a Sunday, the other Churches in the East calculated it according to the Jewish calendar. It was decided that Easter should be celebrated always on a Sunday and never on the same day as a Jewish festival. The council also confirmed the special authority of the bishop of Antioch over Syria and that of Alexandria over all of Egypt. The Churches of Antioch and Alexandria, by virtue of the Apostolic foundation that they could claim, were to be allowed to exercise greater rights than other Churches. The problems surfaced immediately during the reign of his successor. The pro-Arian sentiments and policy of Constantine's son and successor Constantius I (337-61) alienated the Orthodox Christians and by the 60s a new (semi-Arian) formula, which asserted that the Son's essence is 'like' the Father's, or homoiousios, was developed in Antioch and seemed to bear the closest resemblance to the Nicene Creed. The emperor decided that the Nicene Creed was the major cause of disputes and the vague formula of 'likeness' was more suitable to achieve a compromise, a hope which proved to be too optimistic. His successor Julian (the Apostate) (361-63) tried to revive paganism and hoped that the different factions in Christianity would continue to fight and consume one another. He regarded Christianity as apostasy from Judaism and planned to rebuild the Jerusalem Temple which was destroyed by Titus in 70 CE. Christians regarded the end of sacrificial worship and fall of Jerusalem as the end of Judaism. 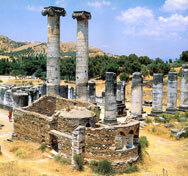 During his Persian expedition, Julian decided to build the Temple at his own expense and from Antioch sent his friend Alypius to supervise the rebuilding. The work, however, was interrupted and abandoned. Ancient literature mentions disasters such as balls of fire bursting from underneath the foundation or fire falling from heaven on the construction and the workers. While some of the emperors after Julian were pro-Arian or Arian, some were opposed. Christians suffered severe persecutions during the reign of rulers of the opposing belief. At the end if the Orthodox cause won this battle it was more because of the fact that Christians had been worshipping Christ as God since the beginning of Christianity, rather than the efforts of Orthodox clergy or emperors.